My last flight of December took me back to Narita. 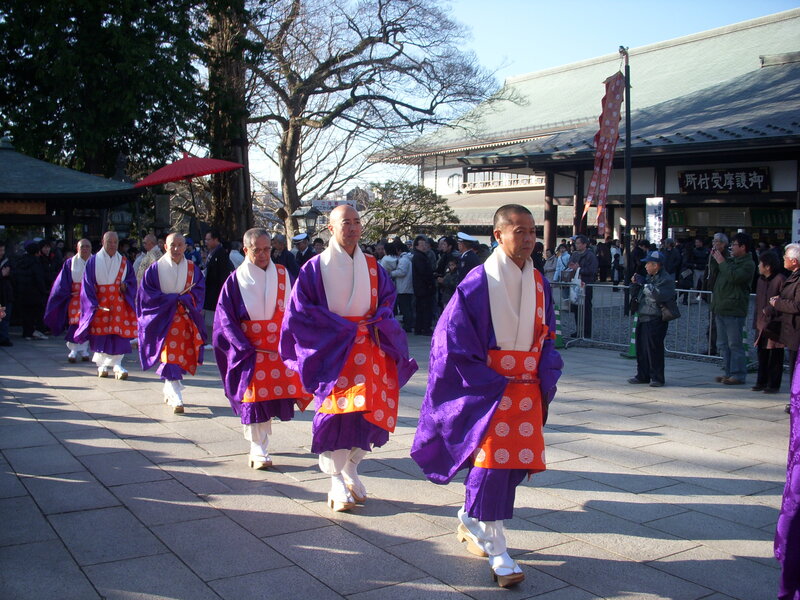 I love spending New Years day in Japan as it the main spiritual holiday of the year with O-Bon running a very close second. 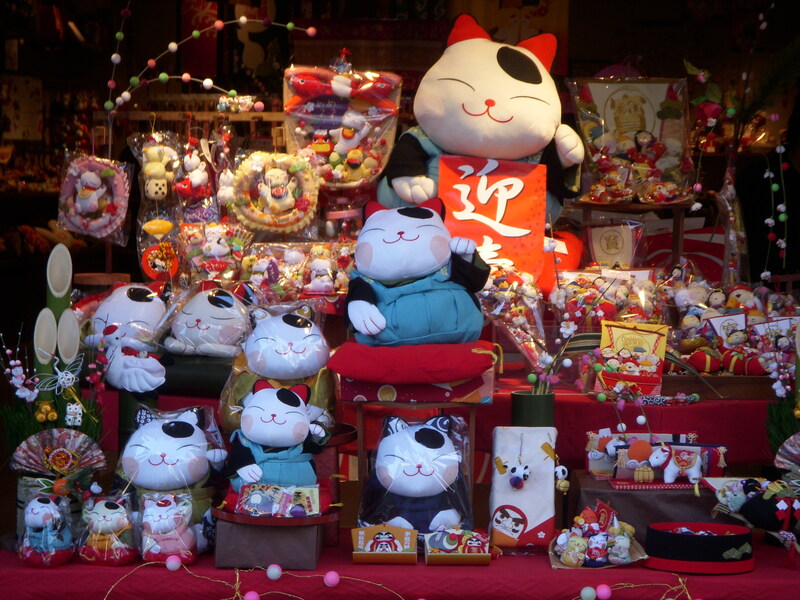 New Years , known as O-shogatsu, in Japan is like spiritual house cleaning: out with the old and in with the new- literally. You gather up all the old amulets and charms from the previous year and cart them all off to be burnt and then buy replacements for the new year. 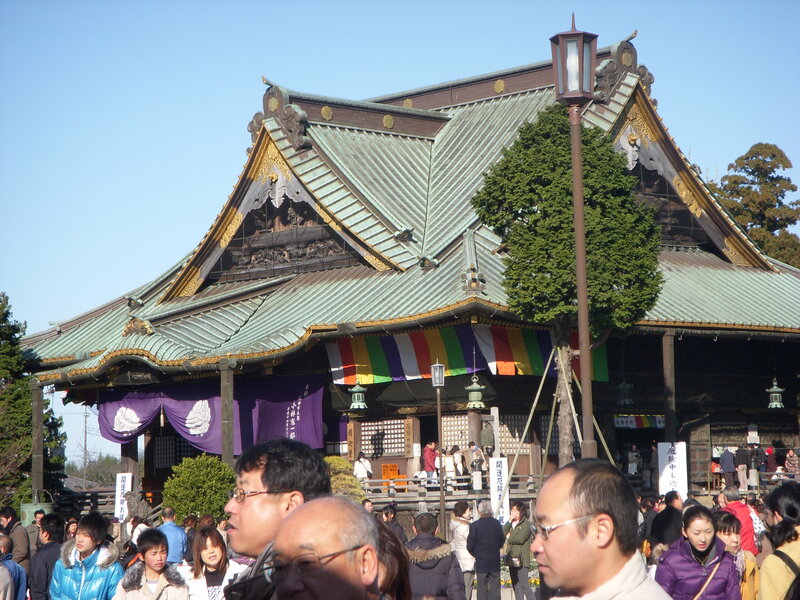 To visit a large temple on the first day of O-shogatsu for the first prayers is especially auspicious with special amulets being only available on the first 3 days of the new year. 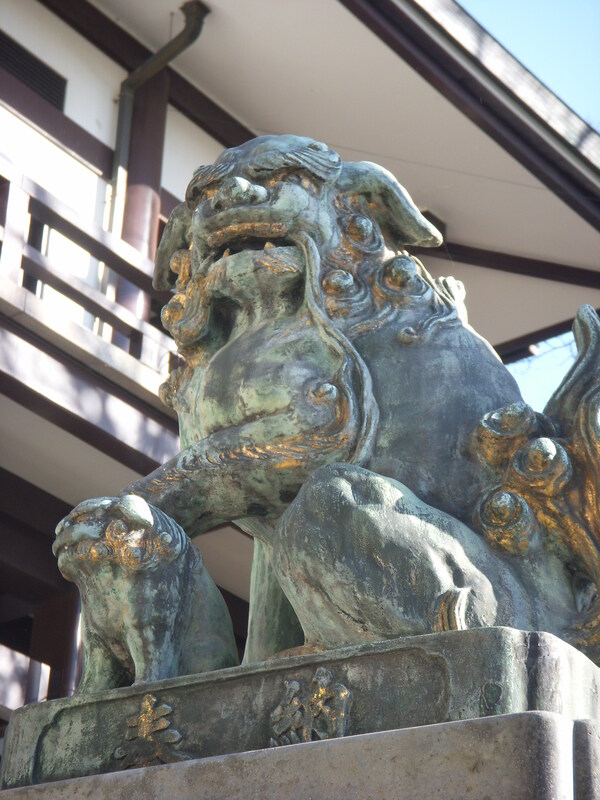 Though Narita is not as old and beautiful as Kyoto, and is basically a town built around the international airport, it is the home of one of the best known and oldest temples in the Kanto region. 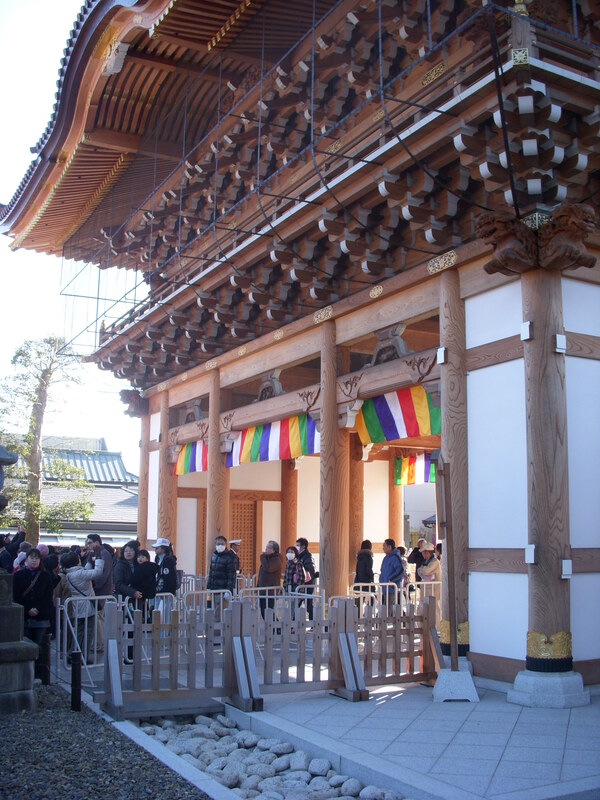 The only temple busier than Narita-san ( Narita Mountain) on O-shogatsu is the Meiji Shrine in Tokyo. 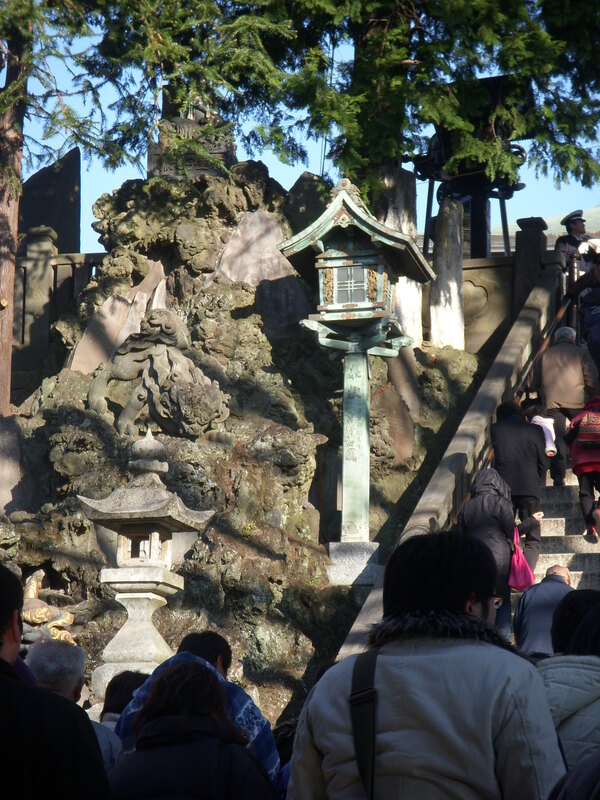 Over 2 million visitors go through Narita-san’s grounds during the first 5 days of the new year. I think there were a few hundred thousand the morning I was there! 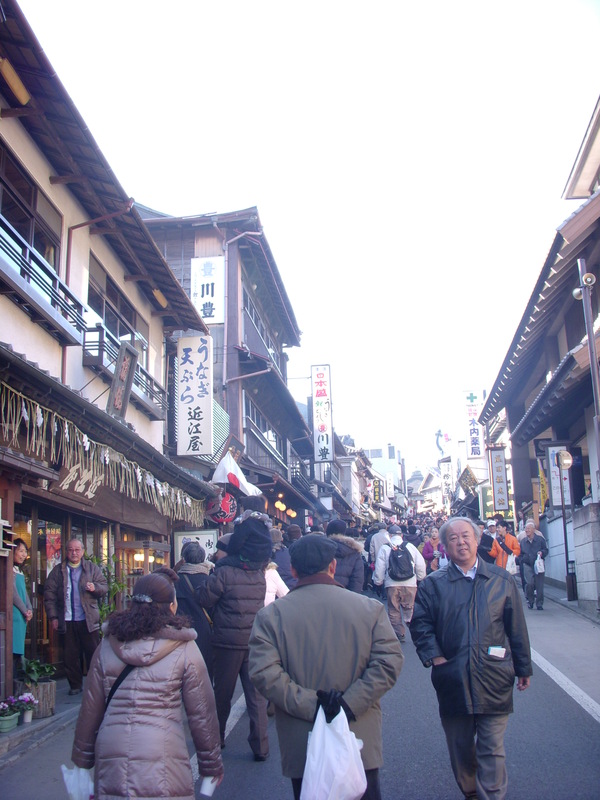 The road to the temple (Omotesando) is lined with colourful traditional shops selling handicrafts, rice crackers, sweets, bamboo goods, tourist trinkets, pickles and dried fish. 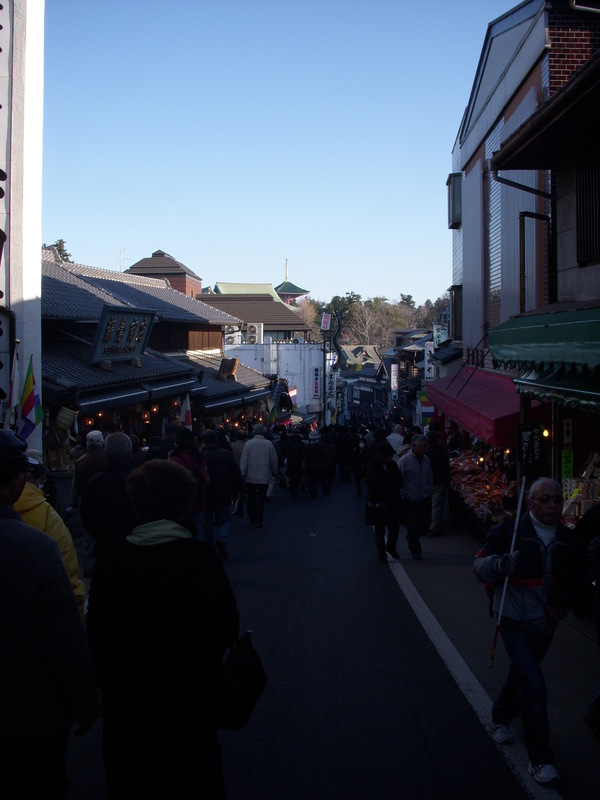 Narita is famous for it’s river eel known as unagi　and many restaurants, some 100 years old, line the street as well. 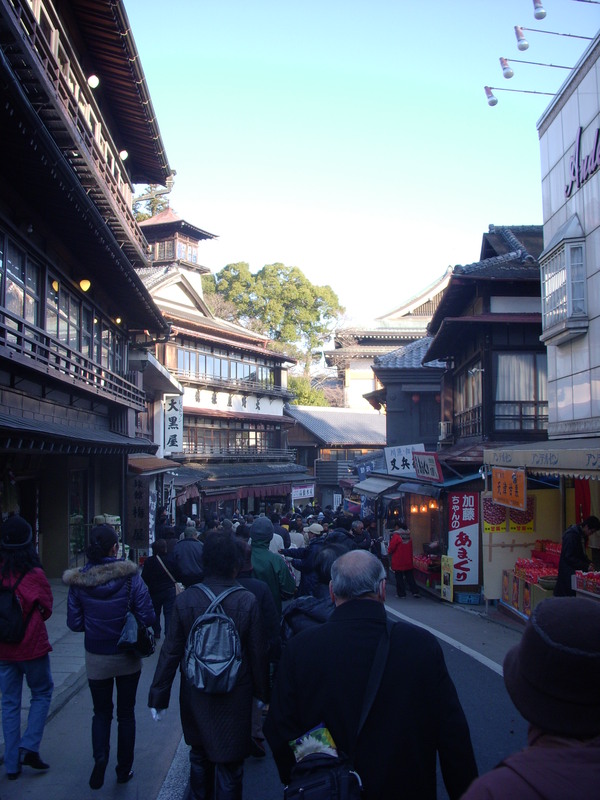 The atmosphere even on a normal day is colorful and festive- during O-shogatsu it’s down right chaotic! 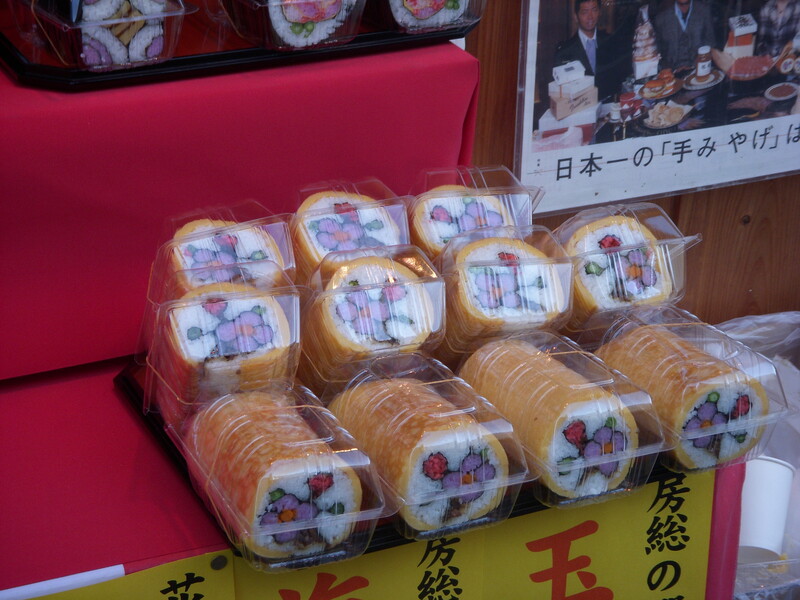 I wound my way down through the crowds and browsed a little in the shops as I moved closer to the temple grounds- making mental notes of what I wanted to eat on my journey back up. The morning was sharp and cold and the sun did little to warm the air. At the bottom of the hill sits the entrance gate to Narita-san, rebuilt in 2008. The yellow of the wood- my guess is cypress- is in such a contrast to the grey of all the other wooden buildings on the grounds. I stopped to wash my hands and rinse my mouth before entering. I laughed as an old Japanese woman snatched the ladle out of my hand before I even had a chance to put it down. Obviously me being a foreigner didn’t seem to faze her! The light was beautiful early in the morning. 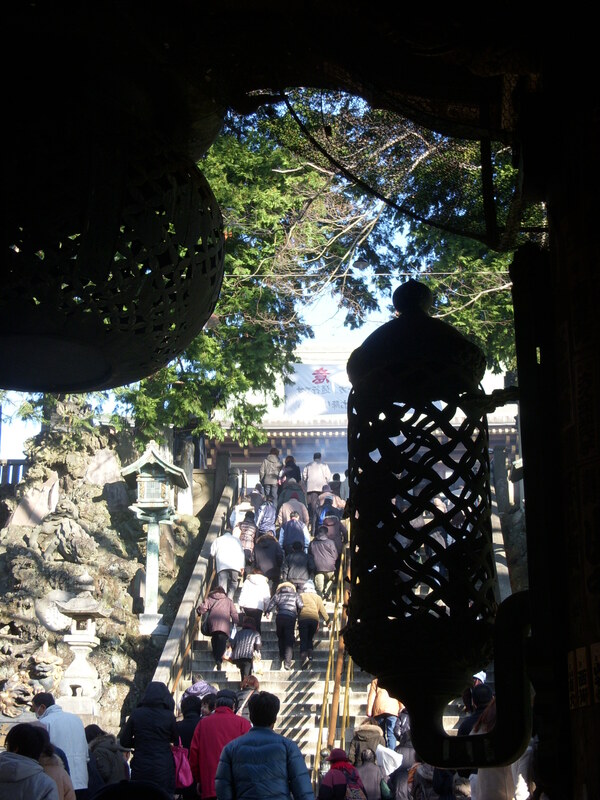 Once I reached the top of the stairs, I coated myself in the thick smoke of the giant incense burner and wafted it over my head and body. 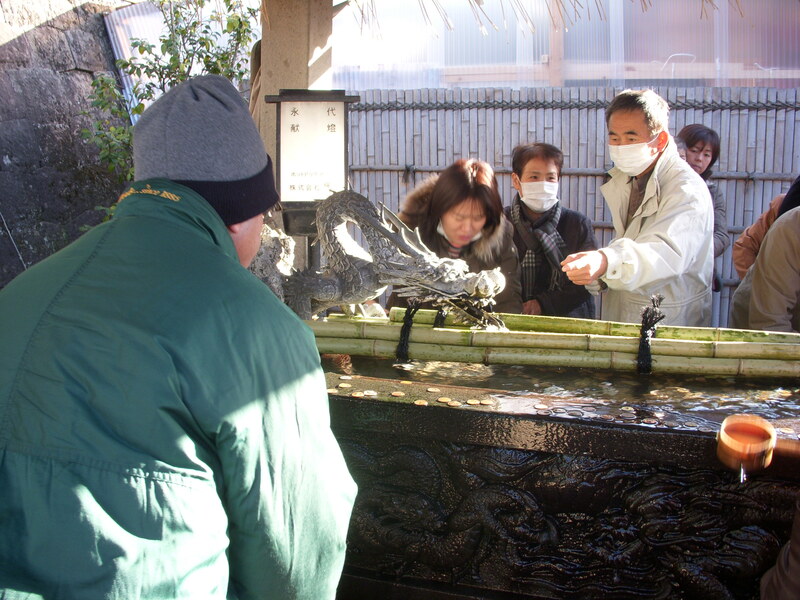 The old folks around me gathered large clouds of incense in their hands and focused the haze to areas of their bodies where they had aches and pains. 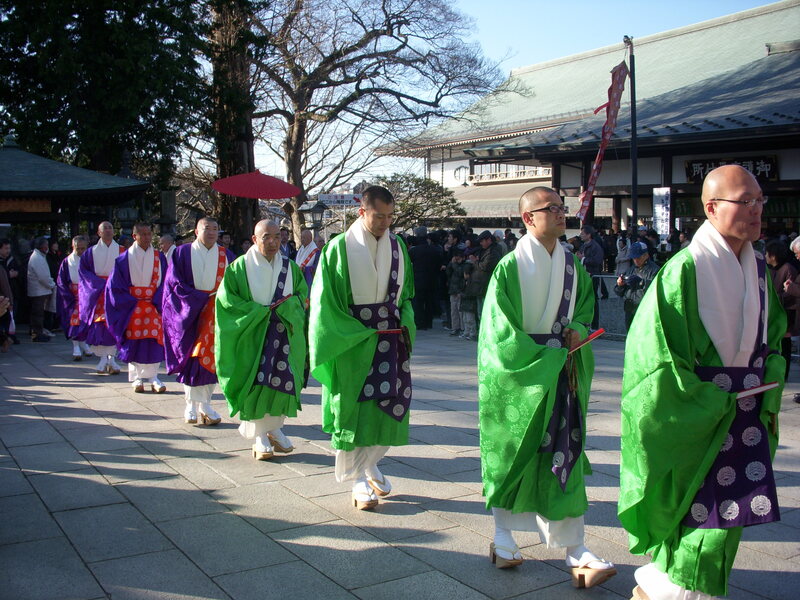 Just as I was finishing the bells began to ring and the priests began to appear as they made their way to the main hall in a long rainbow procession. 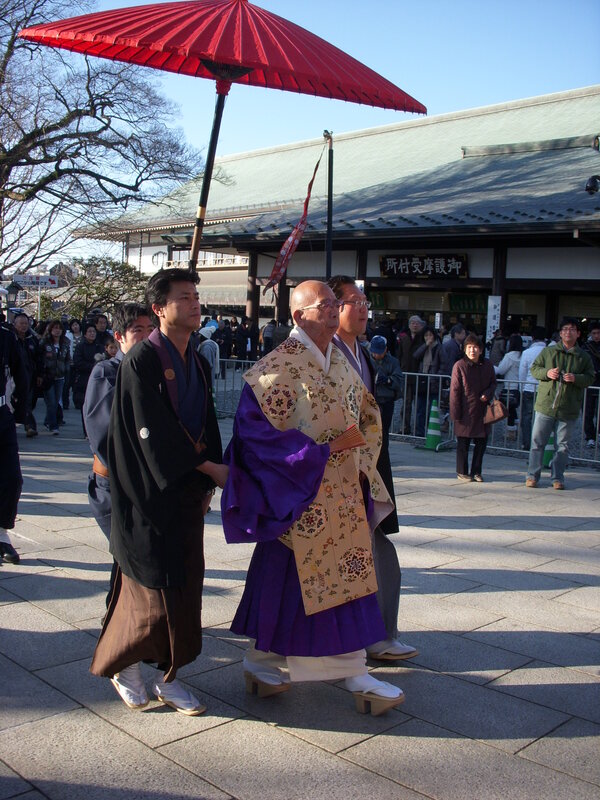 Bright green, purple, and red, they solemnly made their way through the crowd with the head abbot coming last draped in gold and sheltered by a large red umbrella. I quickly ran up behind the procession and shoved my way through the crowds to pull off my boots and sneak a space on the floor of the main hall. 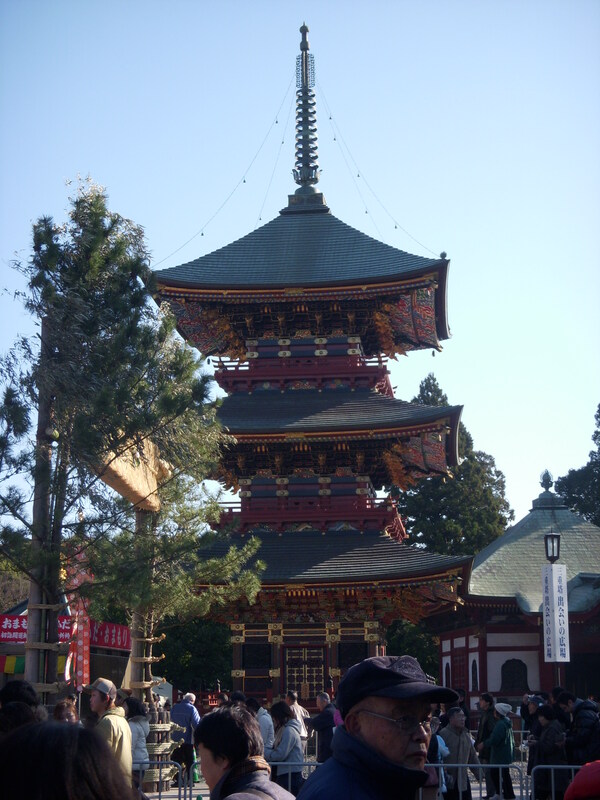 I had been there many times for morning prayers but that morning we were packed in like a morning train in Tokyo. As the ceremony started I quietly thanked myself for my morning yoga practice- though short- had made my limber enough to sit on my legs in oseza. I realized I would be like that for at least 30 minutes. 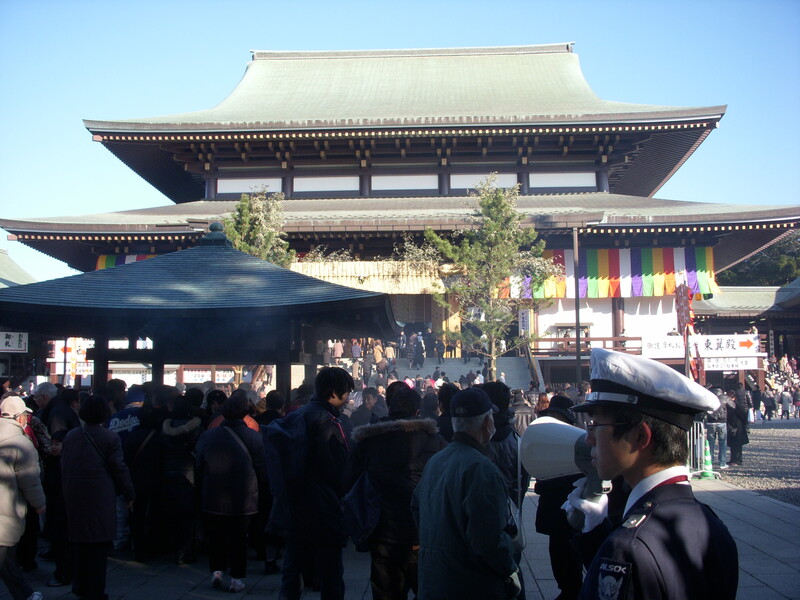 As the prayers started the taiko drums began to sound and a small fire began to rise in front of the abbot. The drums grew louder and the chanting deeper and the fire grew. The heavy smell of incense still enveloped me and the sounds of the room began to blend into this deep vibration that I could feel throughout my body. I remembered coming here shortly after father died for morning prayers and his presence was there with me. 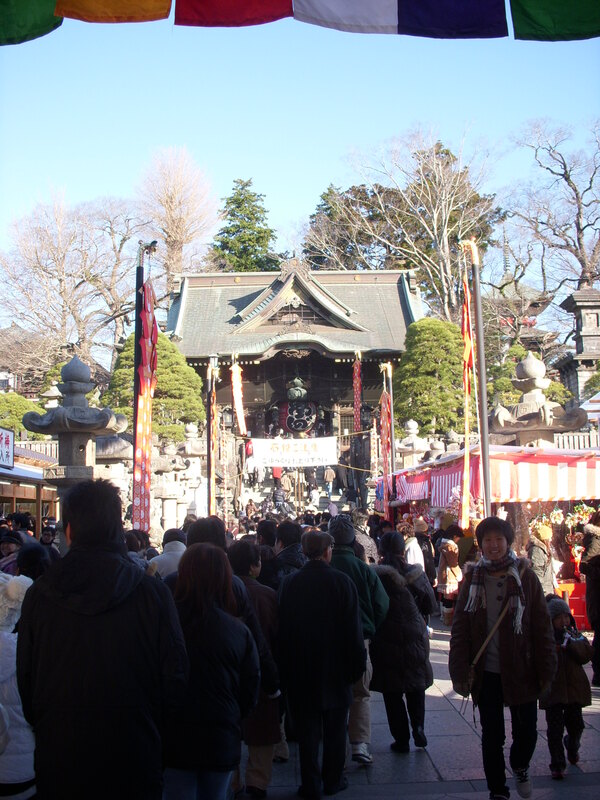 As the priest began prayers to Fudo-myoo, Narita-san’s Buddhist deity, the crowd joined in. I thought of each member of my family and my friends and I prayed for them too. Fudo-myoo, known as Acala in Tibet, is known for sitting in a fire and this ceremony, known as Goma, represents his fire- the power to burn away our ignorance. He also holds a rope in one hand- so he can pull us into enlightenment. Lasso to nirvana? I guess we can all use a helping hand. As the prayers of the abbot finished, the crowd rushed to the side of the alter and started handing over bags and purses to the priests. The priests gathered up five or so at a time and then waved them over the smoke of the Goma fire. I figure I had better make my jump (and I hoped that my legs still worked as I got up) and made my way to the priest. He looked at me quizzically with a “do you know what you are doing?” look and took my bag. I have to admit I think I was the only non-Japanese in the main hall. After my bag was returned, I took a seat again to finish the ceremony. After the ceremony finished a large group of us lined up one last time and we walked single file to the back of the alter to run our hand along a rope that had been wound around a handrail of sorts. 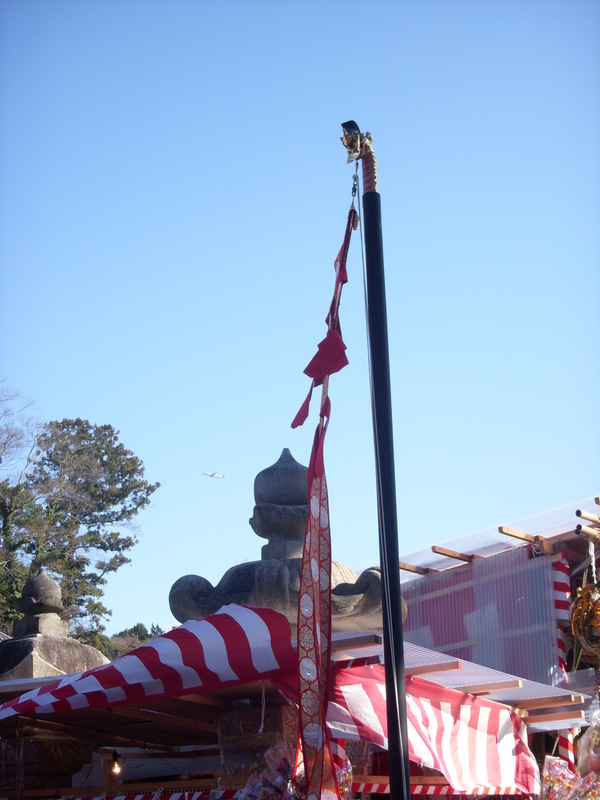 I had no one to ask so I assume this must be a representation of Fudo-myoo’s rope but I am not sure. I popped my boots back on and walked outside; the bright day was really starting to awaken. I could actally feel a little warmth starting to eminate from the sun. 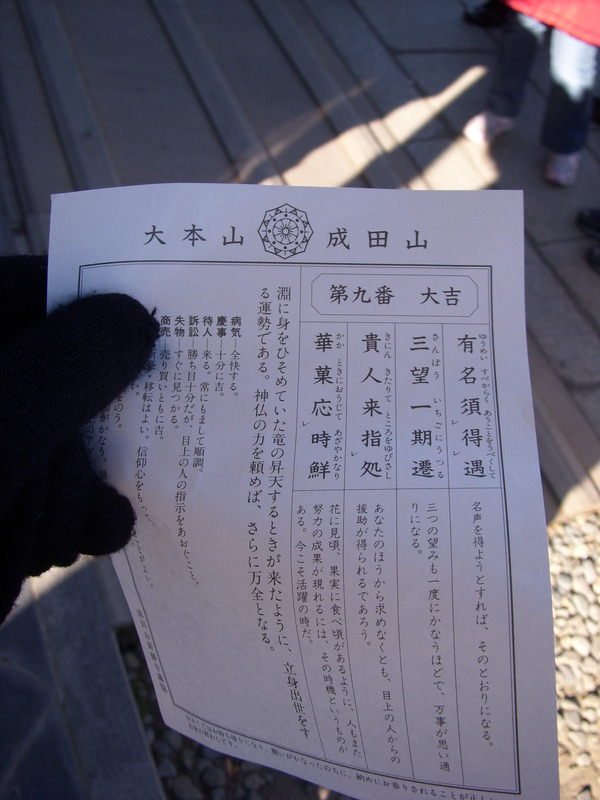 I made my way to buy my new amulets for the year and then went down to buy my fortune. 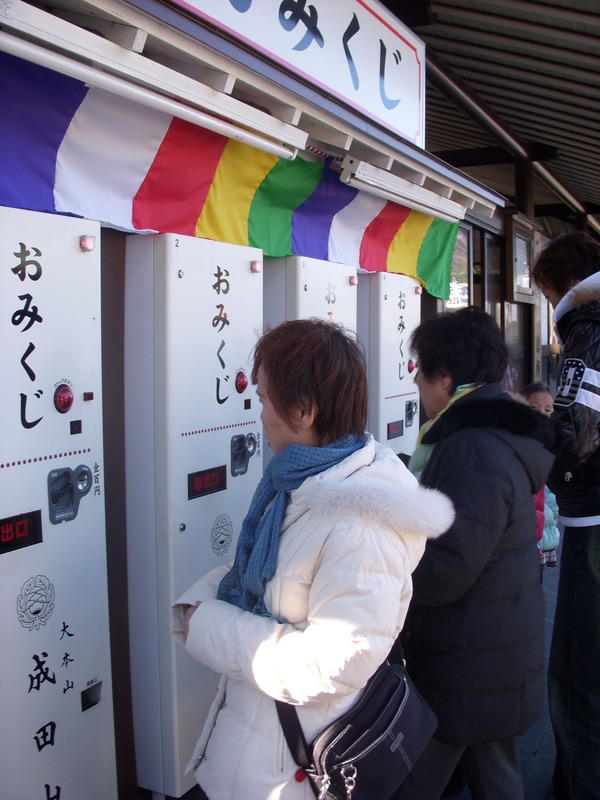 The traditional shaking of the wood box with sticks has been replaced by coin vending machines. Hmm..crass but handy I guess. I put my 100 yen in the machine and out pops my fortune- daikichi! Yatta! The best fortune available. The Japanese looked over my shoulder and laughed along with me but I felt bad as a young woman pouted at her boyfriend and showed him her “unlucky” fortune. You tie the not so good fortunes to trees on the temple grounds and the luckiest ones you keep with you. I placed mine in my wallet with a reminder to get it translated. It’s kind of like reading olde English- I find them difficult to accurately translate myself. 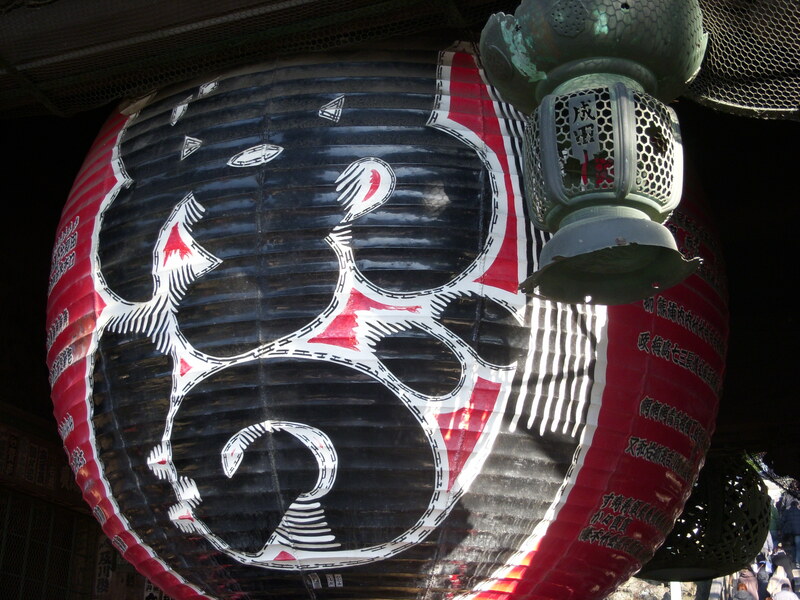 I wandered the grounds for a while longer and then started making my way back up Omotesando. 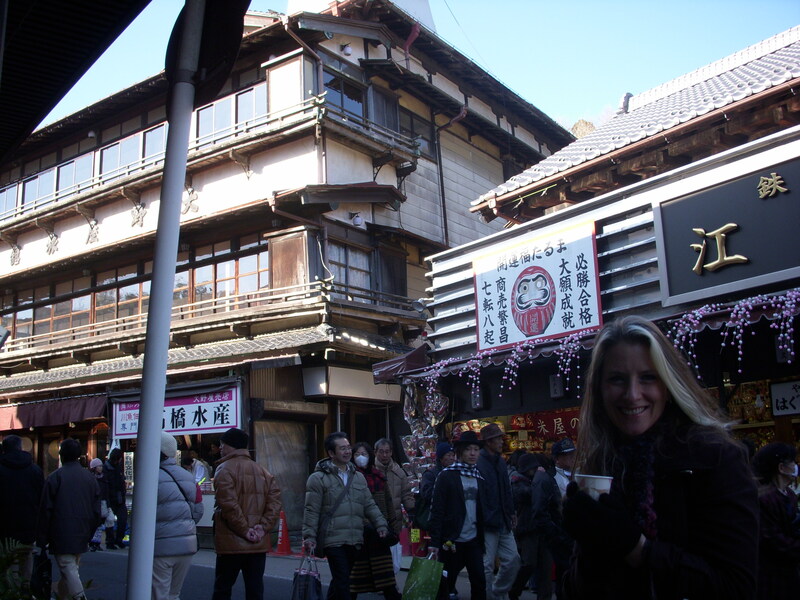 The wind was cold and brisk and I stopped for warm sweet sake on the road. The cup was toasty and the sake hot and it did wonders for warming up my insides. I had a chat with a family from Tokyo as we all drank and then I made my way again. 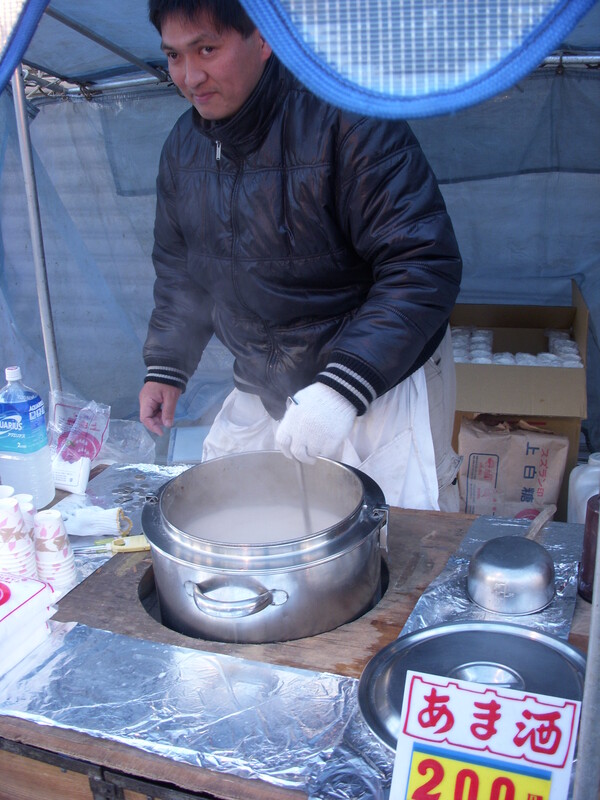 Chestnut vendors lined the road and helpers handed out samples of the warm treat. Warm chestnuts always remind me of Charles Dickens’ novels and a snowy London. I read somewhere that even though it doesn’t snow in London, that during Charles’ youth it snowed an abnormal amount and therefore his books aways had snowy winters. 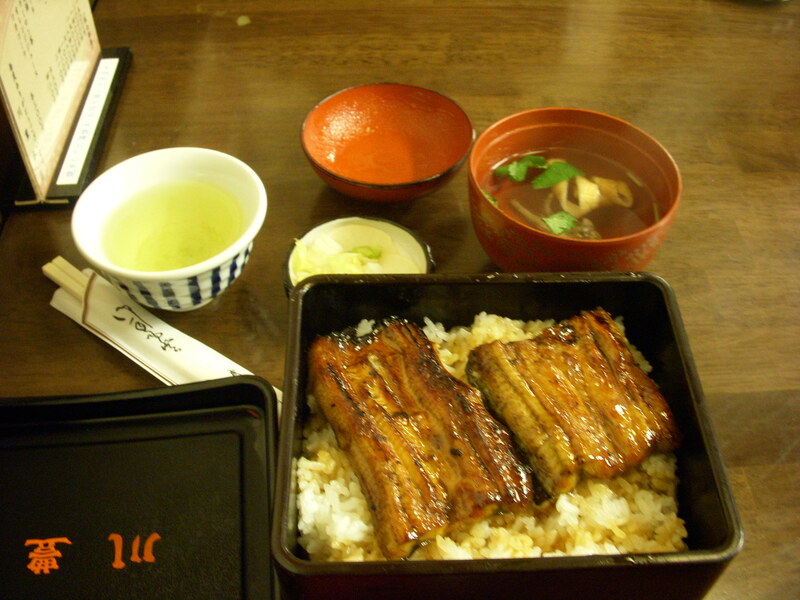 Half way up Omotesando I reached the unagi restaurants and decided to splurge for an expensive eel lunch. I was feeling slightly sorry for myself ,as I really didn’t have much of a Christmas this year with all my flying, and my husband couldn’t join me on this New Year trip like we were planning. I waited beside the men gutting eels on a long timber that is their work table. 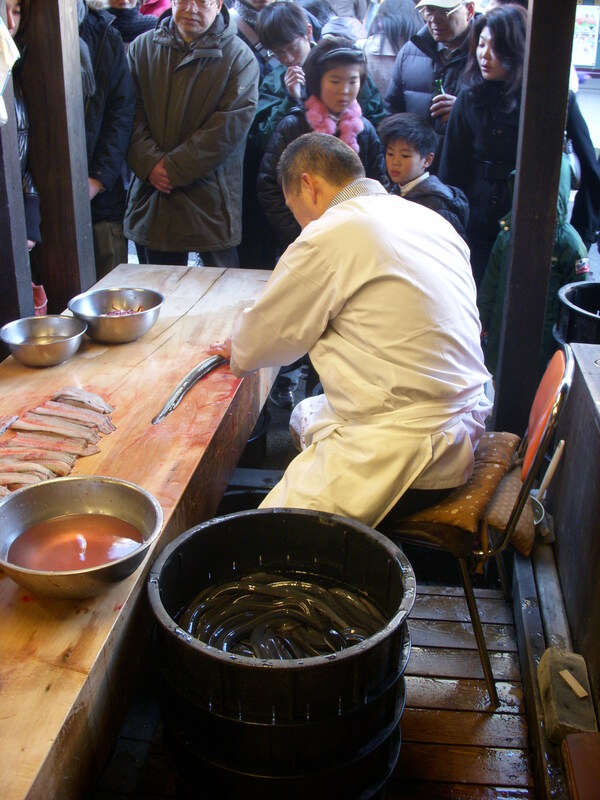 They plucked live eels from the bucket beside them, nailed their head to the wood, and then quickly gutted them. Gruesome but effective. I payed for my meal ahead of time and had a seat at a crowded table. 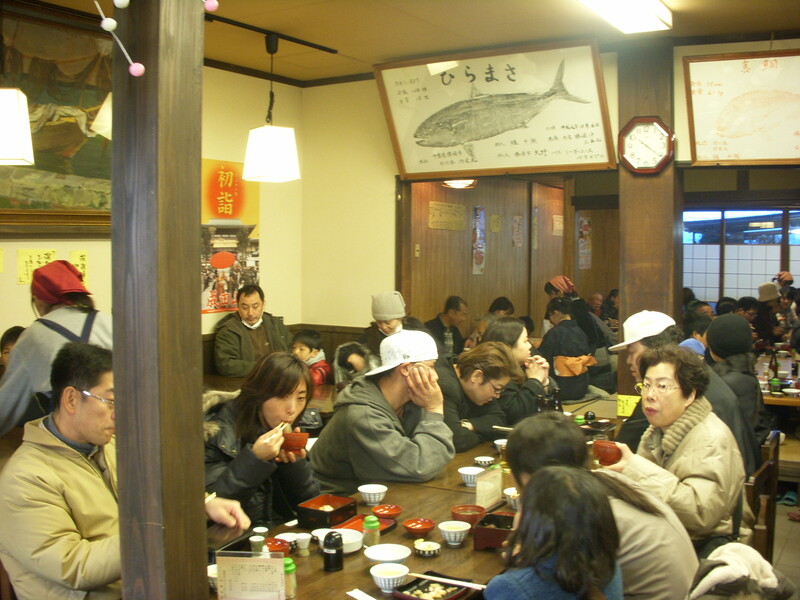 The atmosphere was frenetic yet friendly with the waitresses weaving and yelling as they moved through the throngs of tables and people. My tickets were replaced with a meal a few minutes later and the warm soft unagi melted as I picked it up in my chopsticks. As I lingered over my first bite, I wished again that my husband was there with me. He would have ordered the largest meal and then continued to eat from every little stand on the way up the street. He would have spent 30 dollars in the vending machines trying new coffees and exotic strange Japanese drinks before the end of the day. His first trip to Japan was at New Years and Christmas the year we met so we both have special memories of that time of year. I looked down and realized that I had almost finished my lunch; time to make room for the other customers waiting on the street. I wiggled my way out of the store and on to the street where the crowd seemed to have doubled in size since the morning. I again wandered through a few shops on my way back up and bought a few treats for the flight home. It was then time to go back and rest for the flight home. to go to Narita-san,its takes about 1hour from my parents place !!! i went there many times!! 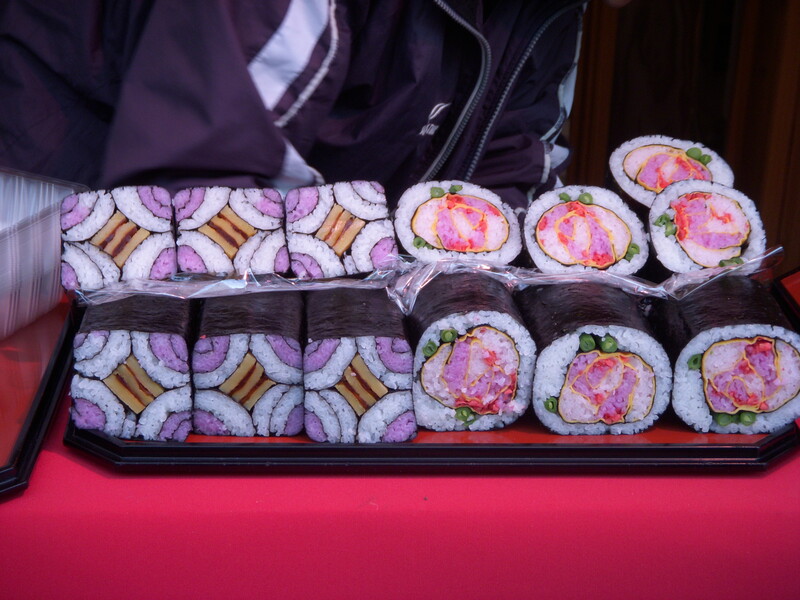 did you enjoy in Japan? ?